David showed kindness to Jonathan’s son, Mephibosheth, by restoring all the land that belonged to Saul and giving him a place at his table — a considerable honor. David provided for Mephibosheth all the days of his life and for Ziba, a servant of Saul’s household as well. 7) David wants to show kindness to someone in Saul’s family. It shows that David is indeed a man after God’s own heart because this is what God would do. It shows David is indeed of noble character and that, like God, David keeps his promises to always show friendship to Jonathan’s descendants forever. 8 ) Part personal Question. My answer: David promises to show him kindness, restore all the land that belonged to Saul so Mephibosheth could farm it and take care of himself, and he offered him a permanent spot at the king’s table (in essence, all his physical needs would be taken care of for life). I receive grace and forgiveness everyday from God and others undeserved. I received God’s Son as my Savior undeserved. I receive mercy from God undeserved. I give to my kids daily undeserved and of my co-workers because that is what we are called to do — sacrifice for others and put their needs first. 9) Personal Question. My answer: I try to show kindness when I happen upon the marginalized and the forgotten, but I don’t go out of my way to find them. This is definitely something I can work on. God is reminding me to show kindness to everyone in my life — family, friends, strangers, co-workers, and anyone who crosses my path whom God has put there so I can reflect Christ to them. Good lesson on doing for others, showing kindness (even undeserved), and doing what Jesus would do. David’s question showed his huge heart as Saul was his enemy. Usually, the king of a new dynasty massacred anyone connected with the prior dynasty. David went against the principle of revenge and against the principle of self-preservation and asked what he could do for the family of his enemy. Why did David want to help Mephibosheth? David did this because he remembered his relationship and covenant with Jonathan (1 Samuel 20:14-15). David wanted to show someone else the same kindness God showed to him. We first learned of Mephibosheth in 2 Samuel 4:4, which says that this son of Jonathan was made lame in his feet from an accident. He fled from fear of being killed since Mephibosheth had the right to the throne. He was a son of the first-born son of the king, and other potential heirs were dead. Later in 2 Samuel 16:5-8 we see a man named Shimei who was a partisan for the house of Saul against David. There were at least a few in Israel who felt that the house of Saul should still reign over the nation, and that David shouldn’t be king. Mephibosheth might draw upon these partisans and develop a rival following. Ishbosheth was Mephibosheth’s uncle, and he waged a bloody war against David for the throne of Israel. There was at least an outside chance that Mephibosheth might do the same. Mephibosheth, probably due to his disability, held a low station in life. He didn’t even have his own house. Instead, he lived in the house of another man. Machir the son of Ammiel later showed his loyalty to David when David’s son, Absalom, led a rebellion against David. Machir supported and helped David at great danger to himself (2 Samuel 17:27-29). 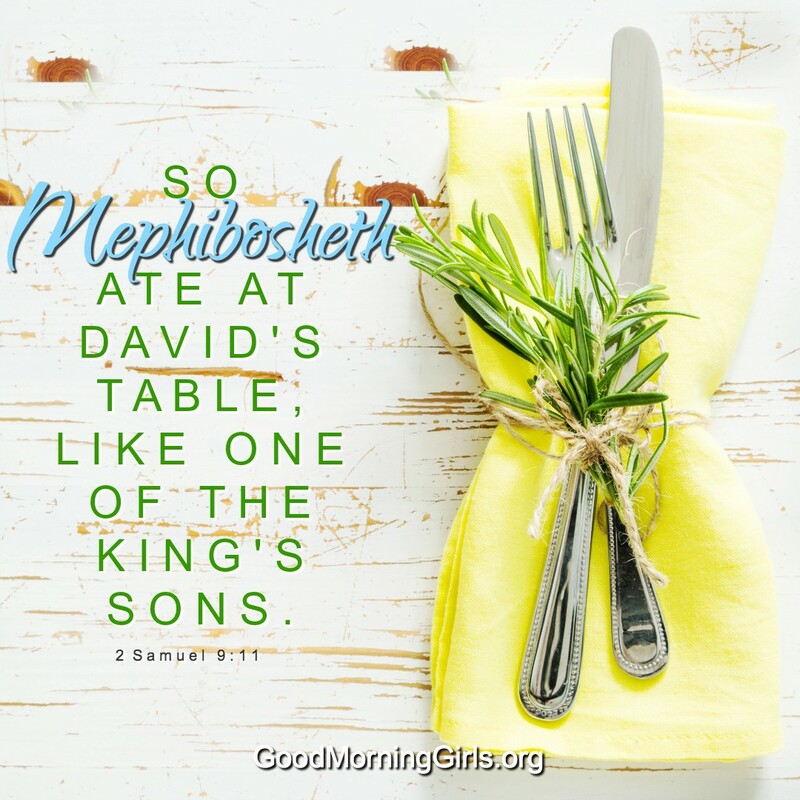 What did David do differently with regards to Mephibosheth? David went against all custom in showing such kindness to an heir of the former dynasty. David gave Mephibosheth the honor of a close relationship with the king, which is what Jesus offers. Jesus told the disciples that they would eat and drink at His table in heaven (Luke 22:30). David gave Mephibosheth servants to work the land. How is David’s grace to Mephibosheth like God’s grace to us? We are hiding, poor, weak, lame, and fearful before our King comes to us. We are separated from our King because of our wicked ancestors. We are separated from our King because of our deliberate actions. We separated ourselves from the King because we didn’t know him or His love for us. Our King sought us out before we sought Him. The King’s kindness is extended to us for the sake of another. The King’s kindness is based on covenant. We must receive the King’s kindness in humility. The King returns to us what we lost in hiding from Him. The King returns to us more than what we lost in hiding from Him. We have the privilege of provision at the King’s table. We are received as sons at the King’s table, with access to the King and fellowship with Him. What does David’s treatment of Mephibosheth teach us about serving others? We should seek out our enemies and seek to bless them. We should look for the poor, weak, lame, and hidden to bless them. We should bless others when they don’t deserve it, and bless them more than they deserve. We should bless others for the sake of someone else.